Delays and Diversions at Rockhampton Due to Low Cloud and Strong Winds - And a Shortened Runway! Passengers travelling into Rockhampton Airport on Thursday 30 April faced delays and diversions as inclement weather passed through the region bringing low cloud and strong winds. Moreover, the continuing works on Runway 15 at Rockhampton Airport - causing a displaced threshold to be in place - also caused several problems with aircraft forced to land 'down-wind' on Runway 33. QantasLink Dash-8-Q400 VH-QOC was first to experience a delay while operating the morning QLK2354 service from Brisbane, forced to go-around while approaching Runway 15 and eventually coming back around to land on Runway 33. Virgin Australia flights seemed to be impacted the most with the morning VOZ1235 flight from Brisbane - operated by Boeing B737-800 VH-VUC - turning back to Brisbane not once but twice during Thursday. While Embraer E-190s VH-ZPK (as VOZ1239) and VH-ZPD (as VOZ1243) also both returned to Brisbane after trying unsuccessfully to land at Rockhampton. It seemed like the larger jets were most affected as highlighted with, as the day went on, both Virgin Australia Regional Airlines (VARA) ATR 72s and QantasLink Dash-8-Q400s successfully landing at Rocky, potentially clearing some of the backlog. 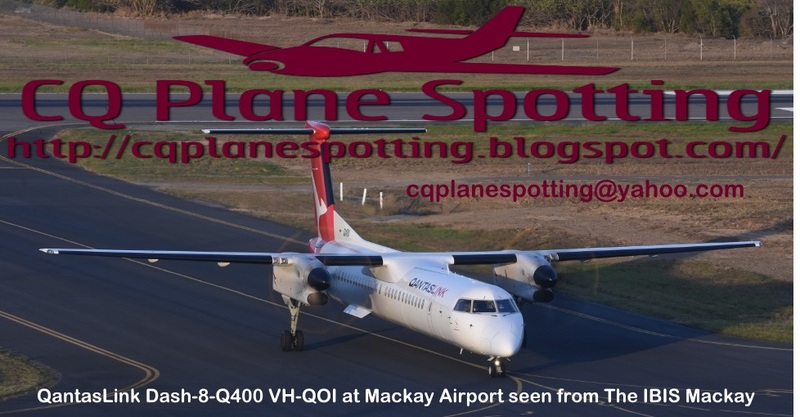 Finally, during the evening on Thursday 30 April, QantasLink (Cobham Aviation) Boeing B717-200 VH-NXG called into Rocky while operating as QJE1770 - the usual Brisbane to Mackay service. After a short while at Rocky, it departed and continued up to Mackay. Touching down at Moranbah Airport on Wednesday 29 April was Corporate Air / Vee H Aviation SAAB 340B VH-VEF. It arrived from Brisbane. VH-VEF spent all of Thursday on the ground at Moranbah and departed back to Brisbane late on Thursday 30 April. Meanwhile, also on Thursday 30 April, Royal Australian Air Force (RAAF) Beech B350 Super King Air A32-671 "Dingo 50" was noted performing a missed approach at Moranbah. Nice to see a different aircraft call into Moranbah Airport other than a QantasLink Dash-8 or Virgin ATR! Over the last couple of days, there has also been a couple of interesting light General Aviation (GA) aircraft and helicopters captured flying in and out of Gladstone Airport by local plane spotters Jamie and Tash. Spotted flying around Gladstone Airport on Monday 27 April were a couple of familiar helicopters in the form of Stirling Helicopters (Stirling Consolidated of Theodore) Bell 206B (II) VH-JAQ and Gladstone Helicopters / Helireef Eurocopter EC135 helicopter VH-ZGZ. VH-ZGZ now wears a small sticker of Gladstone Marine Pilot Services (GMPS). Arriving into Gladstone Airport on Monday 27 April was Kirwan Training (of Victoria) Beech B58 Baron VH-KJV. It arrived from Lilydale and Dubbo. VH-KJV is due to depart Gladstone early on Wednesday 29 April for Toowoomba. 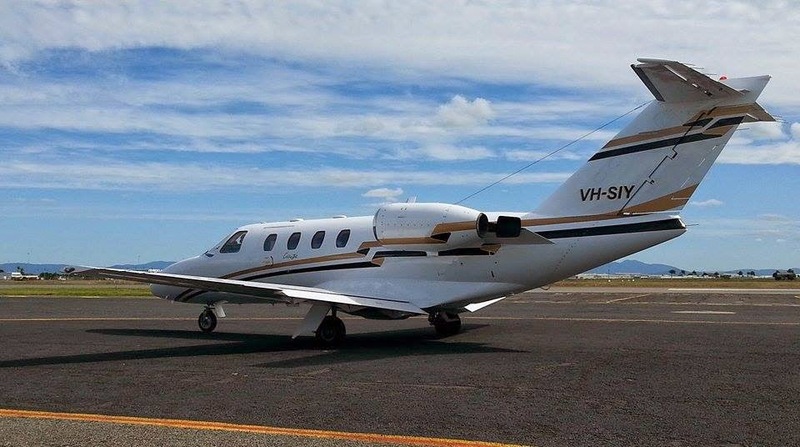 Calling into Gladstone Airport on Tuesday 28 April was BPW Aviation of Scone, New South Wales Cessna 441 VH-EQU. It called in from Rockhampton and later also departed to Bundaberg. 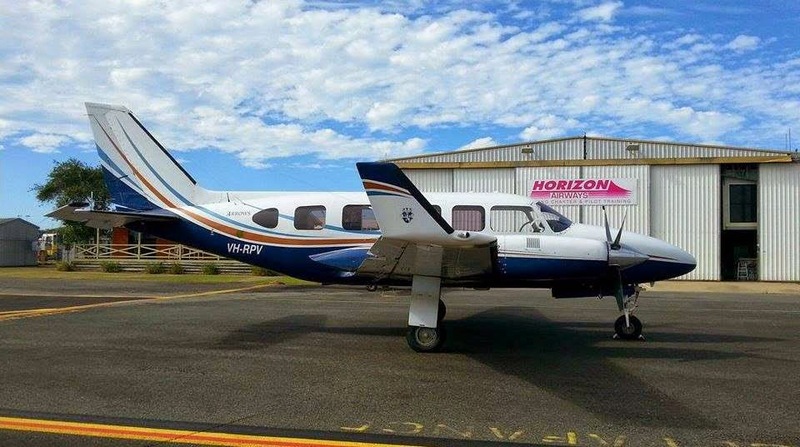 Also visiting on Tuesday 28 April was Bundaberg-based Beech 36 Bonanza VH-TYZ. Certainly a nice mix of aircraft captured by Jamie and Tash at Gladstone Airport over the last couple of days - we thank them sincerely for sending through these great photos! The visiting Earth Commodities Cessna 550 Citation Bravo bizjet VH-CCJ - which arrived into Gladstone Airport the previous day - made a spectacular departure from Gladstone Airport to Bundaberg on Tuesday 28 April. Local plane spotters Jamie and Tash report that for most of Tuesday morning aircraft arriving and departing Gladstone Airport were using Runway 10. However, VH-CCJ made a spectacular departure of the opposite Runway 28, rotating early and then maintaining a low level as it passed by Jamie and Tash. Some stunning photos of a sleek little bizjet - sincere thanks to Jamie and Tash for sending these through! Local plane spotter Kayanne H popped out to Rockhampton Airport and captured a nice pair of Cessna turboprops that called into the beef capital on Tuesday 28 April. While its exact movement details are not known, BPW Aviation of Scone, New South Wales, Cessna 441 VH-EQU touched down first. It later departed to Gladstone and then Bundaberg Airports. Kayanne's photos also show locally-based Peace Aviation Beech A36 Bonanza VH-MMB departing Rocky on a local flight. Finally, Henty Aviation (Avcair) Cessna 425 VH-BSM was also spotted by Kayanne. Again, the exact movements of this lovely corporate Cessna turbo-prop are not known. Brenzil Dassault Falcon 7X bizjet VH-CRW was noted on the ground at Emerald Airport on Tuesday 28 April. 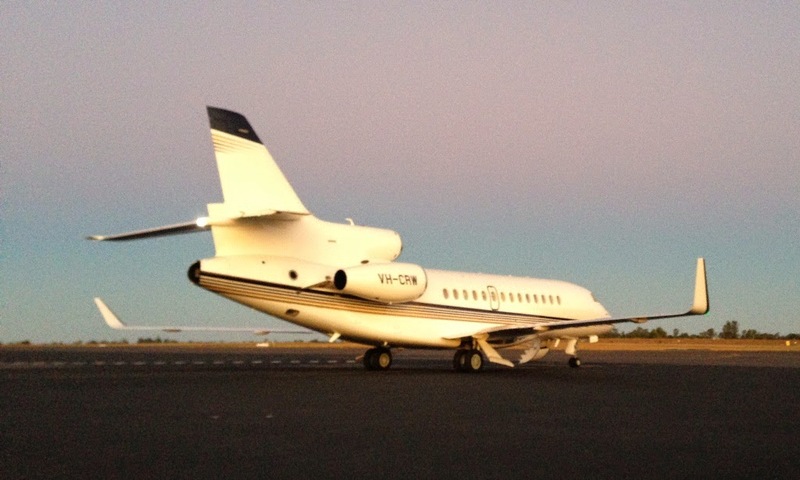 The sleek corporate jet called in early from Brisbane and returned to the capital after dark. 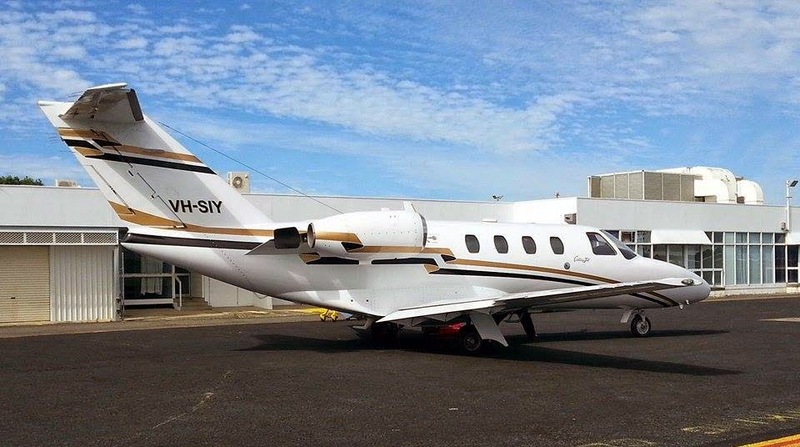 Of interest, another familiar bizjet to Emerald in the form of Mackellar Mining Equipment / Flight Options (Australia) Cessna 560 Citation Ultra bizjet VH-MMC called in last Tuesday 21 April from the Sunshine Coast. It departed back there on Thursday 23 April. Spotted on the ground at Mackay Airport on Tuesday 28 April was Machjet (Machjet International) Cessna 525 Citation CJ1 bizjet VH-SIY. While its exact movements are not known, an ambulance was spotted nearby to VH-SIY so it may been operating a medical transfer flight. Also captured at Mackay Airport on Tuesday 28 April was Emerald-based Aero-Professional services Piper PA-31-350 VH-RPV. As we've mentioned before, VH-RPV is a rare Colemill Panther re-engined Navajo with 350hp (261 kW) Lycoming TIO-540-J2B engines, 4-blade "Q-Tip" propellers and optional winglets. This conversion was designed by Colemill Enterprises of Nashville, Tennessee in the United States of America. Finally, an interesting visitor to Mackay over the last couple of days was Interair (Photomapping Services) Piper PA-31 Navajo VH-XGL. VH-XGL initially arrived into Mackay from Cairns on Monday 27 April after it spent most of last week operating survey flights out of Kununurra in West Australia. It also operated a pair of survey flights out of Mackay on Monday and again on Tuesday 28 April. It then departed Mackay for Walgett and Melbourne (Essendon) Airport later on Tuesday. Finally, last Thursday 23 April very smart looking New South Wales-based Eurocopter EC120B Colibri VH-WII called into Mackay briefly while seemingly on a flight to the North, while on the previous Friday 17 April, Nautilus Aviation Bell 407 VH-VHU was noted calling into Mackay from Proserpine / Whitsunday Coast Airport. It's been a great few days for plane spotting at Mackay Airport with these nice visitors along with the Earth Commodities Cessna 550 Citation Bravo bizjet VH-CCJ and Caboolture-based CAC CA-18 Mk21 Mustang VH-MFT 'Snifter' which both departed on Monday 27 April. Board member and Newsletter Editor of the Rockhampton Aero Club (RAC) Paul T has sent through some great photos of a new helicopter to grace the skies above CQ in the form of OAS Parts (Bell) UH-1H Iroquois Helicopter VH-OXE. 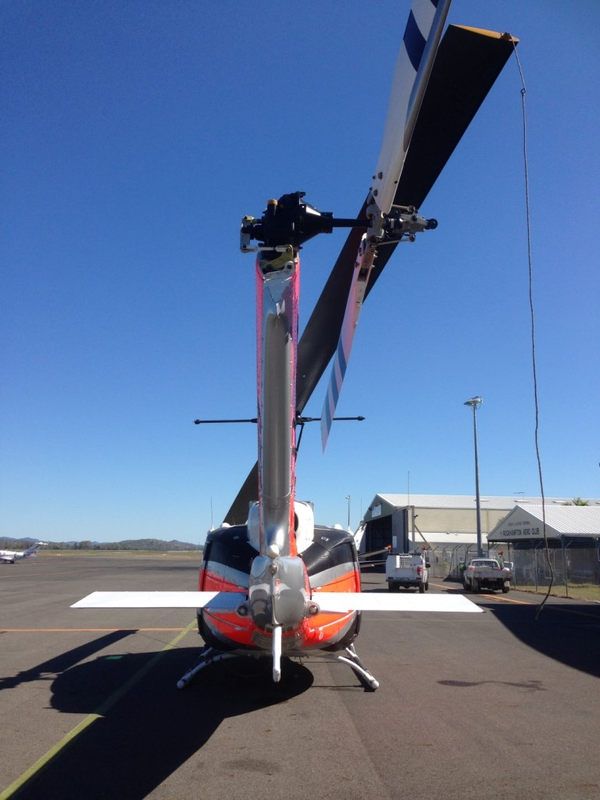 VH-OXE is currently registered to - and wears the colours of - Touchdown Helicopters of Albion Park Rail (Wollongong). VH-OXE is reportedly being utilised (leased) by Stirling Helicopters (Stirling Consolidated on Theodore) as a fire fighting and heavy-lift platform and will be (at the time of writing) based at Rockhampton Airport until later this year. Paul also reports that the big Bell was previously operated by the United States Army wearing the serial number 67-17187. It was built in 1967 and reportedly has only 6000 hours 'on the clock'. Thanks Paul for sending through these great photos of a great helicopter! Earth Commodities Cessna 550 Citation Bravo bizjet VH-CCJ has returned to Central Queensland on Monday 27 April. It initially touched down at Gladstone Airport from Brisbane before heading further North to Mackay. From Mackay, VH-CCJ returned back to Gladstone later on Monday where it appeared to be staying for the night. Early information suggests that VH-CCJ will head South from Gladstone to Bundaberg around lunchtime on Tuesday 28 April before returning to Brisbane.